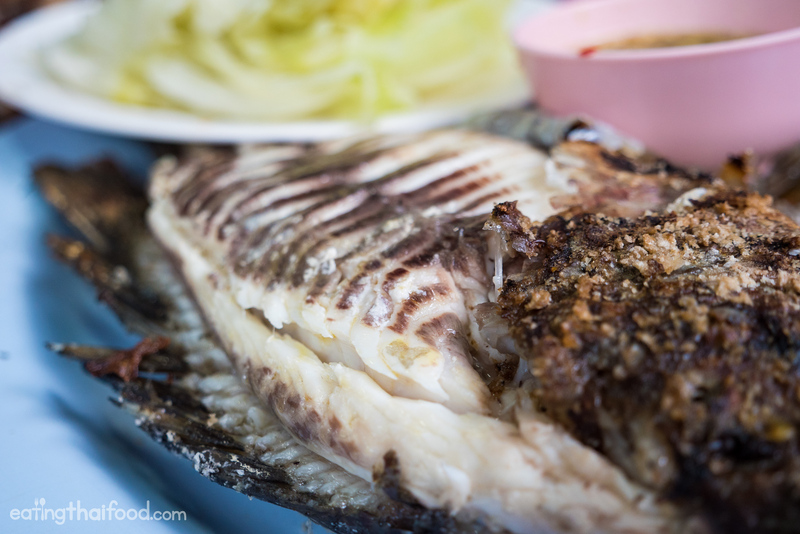 If there’s one thing I remember most about staying in Udon Thani, it’s grilled fish. Not quite in Udon Thani, but instead just off the Surasak BTS in downtown Bangkok, Laab Udon (ร้านลาบอุดร), named after Udon Thani, serves some pretty good grilled fish as well. You’ll see the grilled fish right as you walk in. Located just off the Surasak BTS station on the corner of the Charoen Rat and Sathon, Laab Udon (ร้านลาบอุดร) is in such a good location that I had actually walked past it many times and completely missed it. It’s a street food style restaurant, yet in a permanent open air makeshift shelter. At the front of the restaurant are a couple half barrel grills, and when the restaurant is open during the evenings, the grills are filled with salt crusted fish waiting to be ordered. 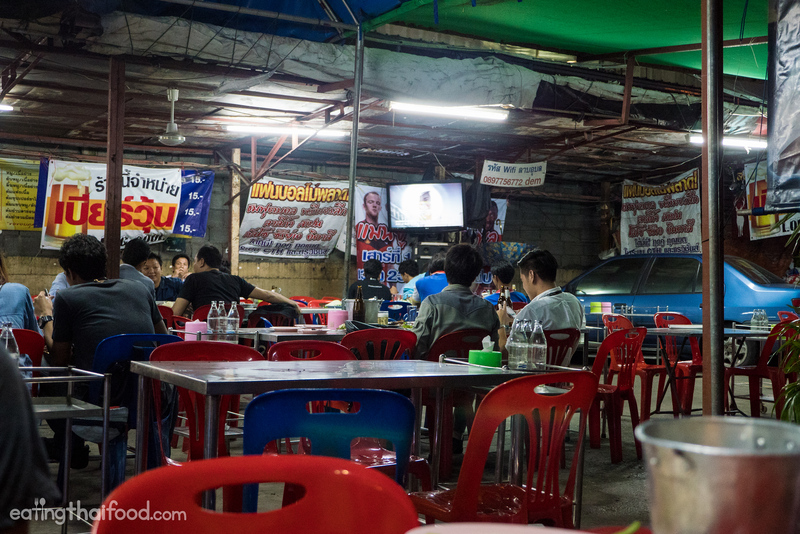 Due to location and atmosphere, it’s the type of restaurant a lot of people come to after a day of work, to hang out with friends and co-workers, have a drink, and eat some Isaan street food. I think there are quite a few people who come to wait out the traffic after work before leaving Sathon. 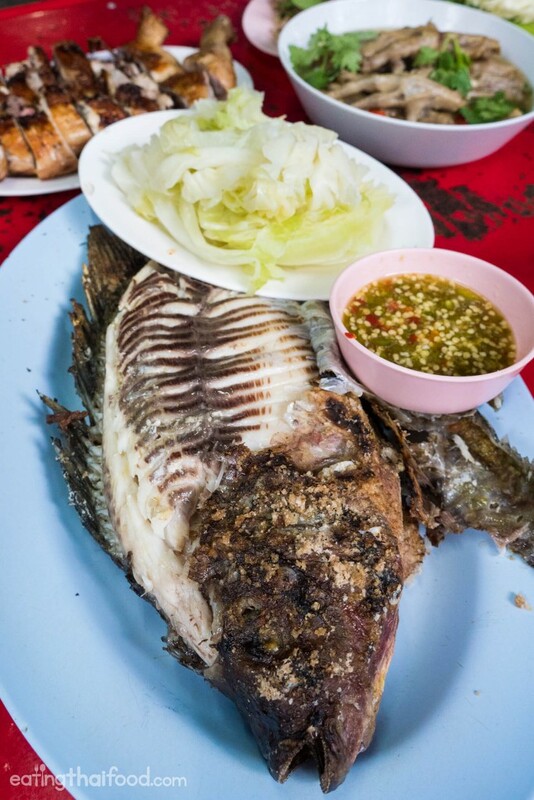 Let’s start with the grilled fish, known in Thai as pla pao (ปลาเผา). Typically at Laab Udon (ร้านลาบอุดร) they have either snakehead fish, or tilapia, but on the day we went they only had tilapia. But that’s probably what I would have ordered between the two anyways, so that’s alright. 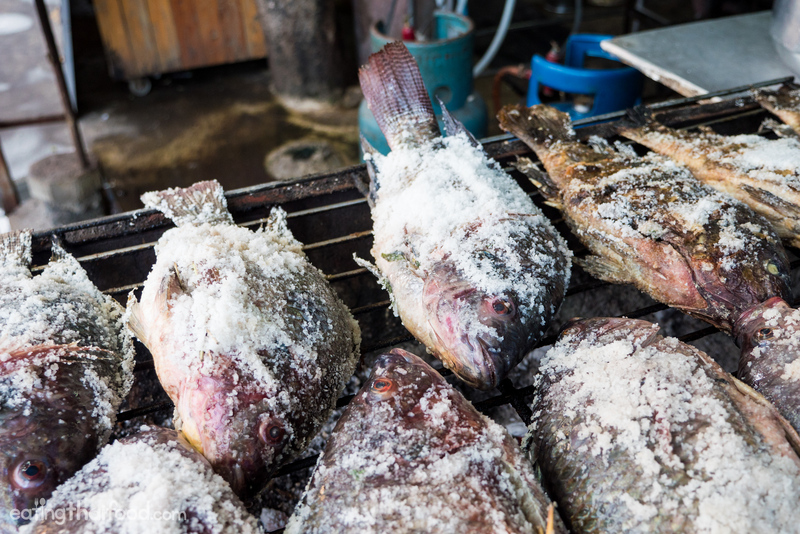 You’ll see the selection of salt crusted fish at the front of the restaurant when you walk in, on the grill along with some chicken. It was a very good pla nin pao (ปลานิลเผา) – the fish was nice and juicy, plus the meat was firm indicating that it was very fresh as well. The fish was good size, nice and meaty and flaky. The seafood sauce served with the grilled fish was a little on the sweet side for me, but luckily they also brought us some nam jim jaew (น้ำจิ้มแจ่ว the sauce served alongside the plate of raw garnishing vegetables), which was a wonderful sauce. I ended up eating most of the fish with the red nam jim jaew. 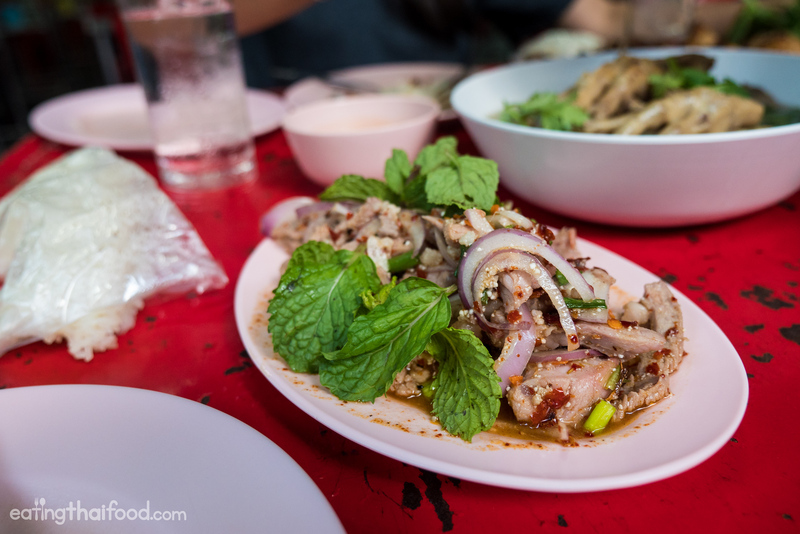 Laab Udon (ร้านลาบอุดร) serves great Isaan style pla pao (ปลานิลเผา), grilled fish, in Bangkok. I have a real soft spot for som tam (green papaya salad), especially the versions that are wildly spicy and pungent with fermented fish sauce (pla ra). 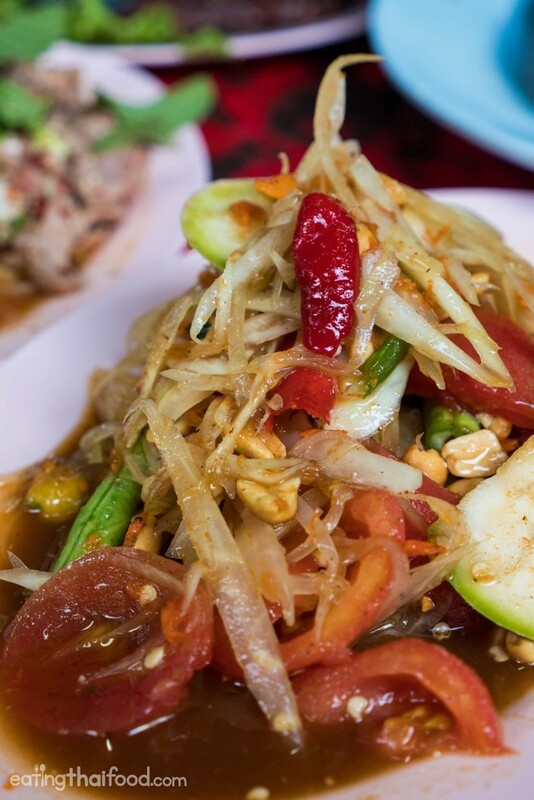 We ordered their tam Khorat (ตำโคราช), which is a version of som tam from Khorat that is basically som tam Thai (the sweet and sour version), with the extra addition of pla ra (fermented sauce). 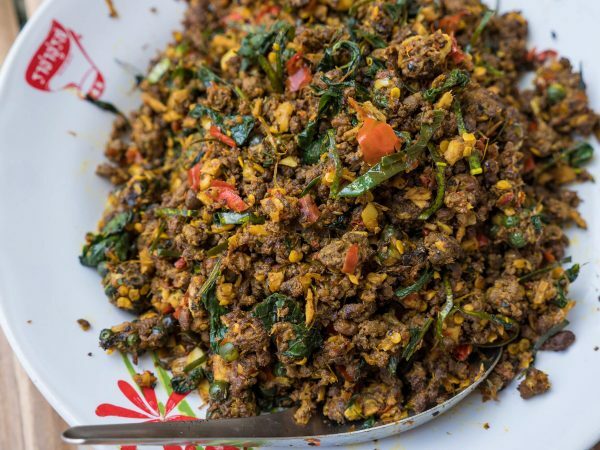 The tam Khorat (ตำโคราช) was a little on the sweet side for my taste, but I should have stuck with tam Laos (ส้มตำลาว), or just a good ol plate of som tam boo pla ra. The som tam variations were all good though, and even the tam Khorat (ตำโคราช) is supposed to be a bit sweet, just too sweet for me. 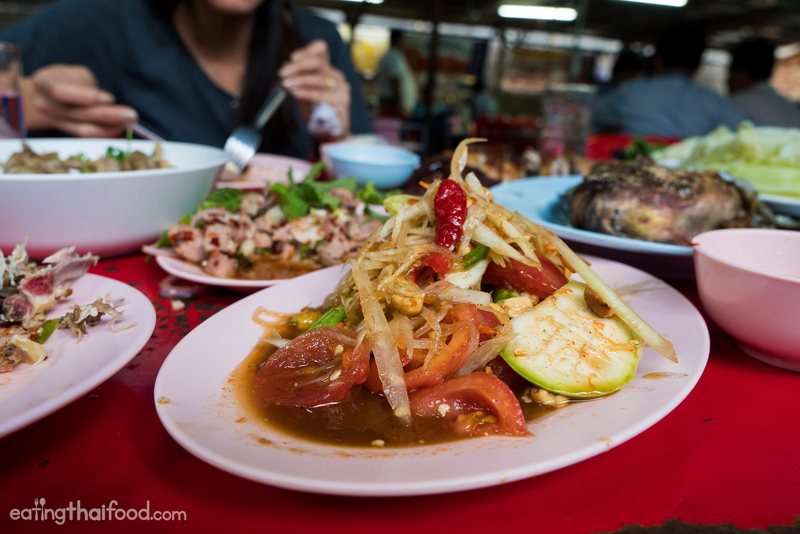 Tam kai kem (ตำไข่เค็ม) on right, and how could you no appreciate their weathered tables!? Ying (my wife) had a plate of tam kai kem (ตำไข่เค็ม), som tam Thai (sweet and sour green papaya salad), but with the addition of salted eggs. It was pretty good, still a little on the sweet side (as it typically is), but with the salted egg making the dressing more rich, creamy, and with a salty flavor instead of just saltiness from fish sauce. 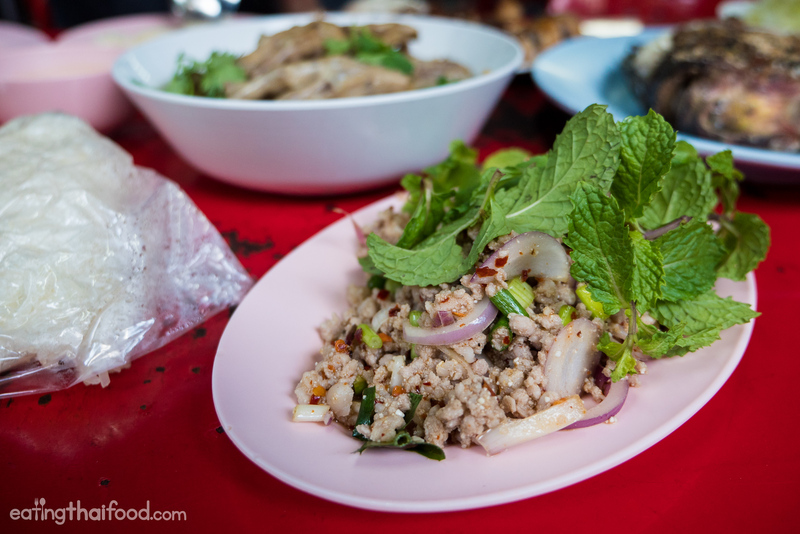 We also ordered a plate of laab moo (ลาบหมู), one of the most well known Isaan minced meat salad dishes. The taste was really good – sour, spicy from dry chili flakes, and with a good handful of sliced shallots (but they may have been red onions), green onions, and mint leaves. The actual quality of the pork itself, wasn’t so good (not that I could expect that much). But the taste and balance of flavor was good. 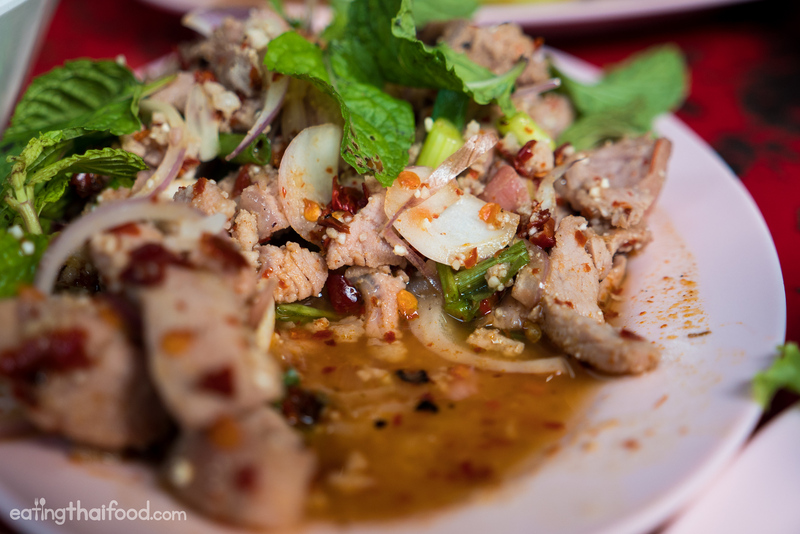 The nam tok moo (น้ำตกหมู), a salad of grilled pork, sliced into pieces and mixed with a dressing very similar to laab, was alright, but nothing spectacular either. Again, the taste of the dish was good, but the meat itself just wasn’t great. 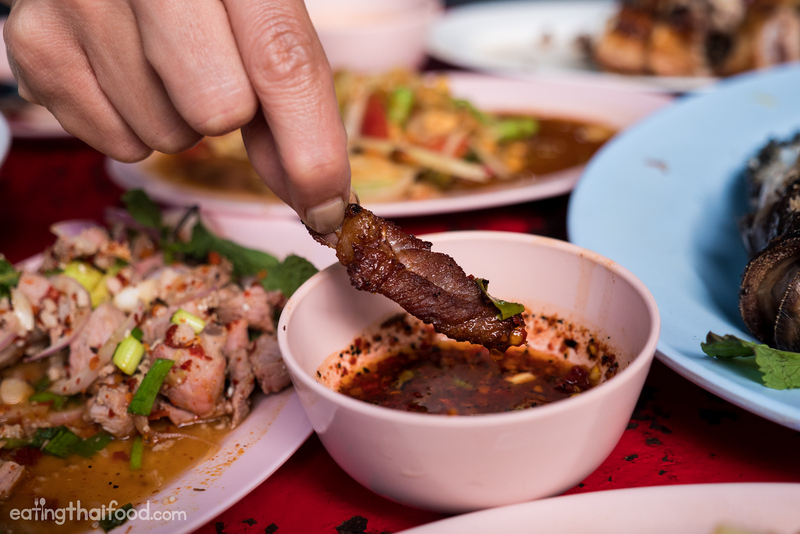 I’m not saying it is ever going to be top quality meat for the price here, but at other similar street food stalls the texture of the meat can be better, and it should have had a more grilled flavor to it. The meat almost tasted like it had been stir fried as opposed to grilled. However, it could have very well been just by luck with the piece of meat I happened to get with my order of nam tok moo (น้ำตกหมู). When I ate at Laab Udon (ร้านลาบอุดร) there were just 3 of us eating… but my wife was doing the ordering, and she was really hungry. And when she’s hungry she tends to order a little more than necessary, which I don’t complain about! 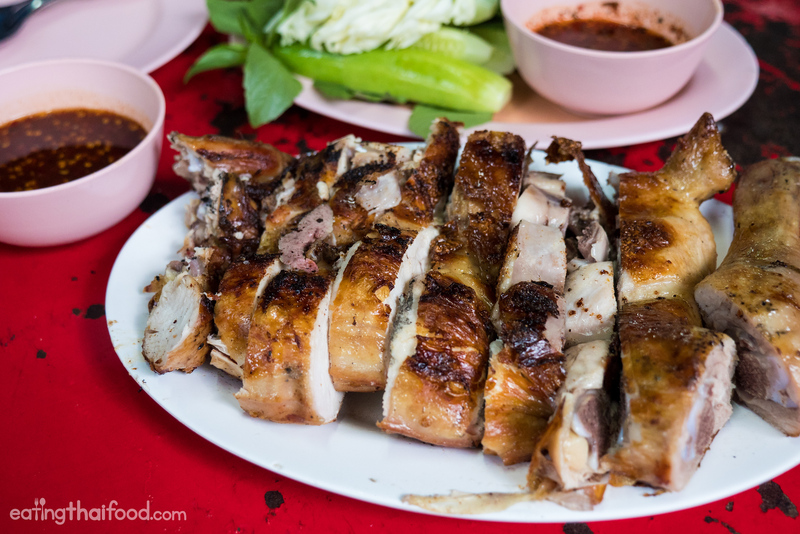 So we had a 1/2 of a gai yang 1/2 (ไก่ย่างครึ่งตัว), grilled chicken. The chicken was alright, but a little dry. To me it didn’t compare to the fish – go for the fish over the chicken. 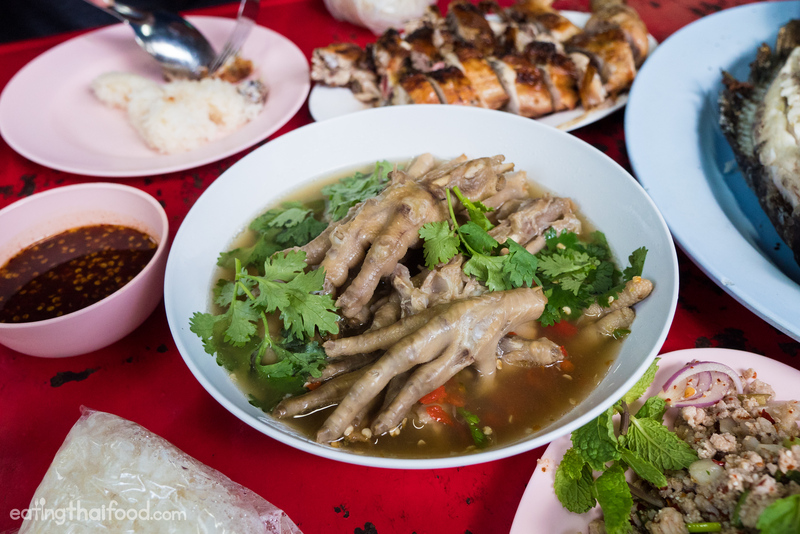 Ka gai super (ขาไข่ซุปเปอร์) – chicken feet soup was incredible! I’m not a huge chicken feet eater – not that I don’t like them, there’s just not a whole lot to eat on them. But we did order the ka gai super (ขาไข่ซุปเปอร์), a famous Thai chicken feet soup, and along with the grilled fish, it was one of my favorite dishes at Laab Udon (ร้านลาบอุดร). The chicken feet themselves were chicken feet. But the soup was really flavorful, nice and sour, salty, and bursting with pounded chilies. If you go, even if you don’t like chicken feet that much, it’s well worth ordering the ka gai super (ขาไข่ซุปเปอร์) just for that flavor satisfying broth. 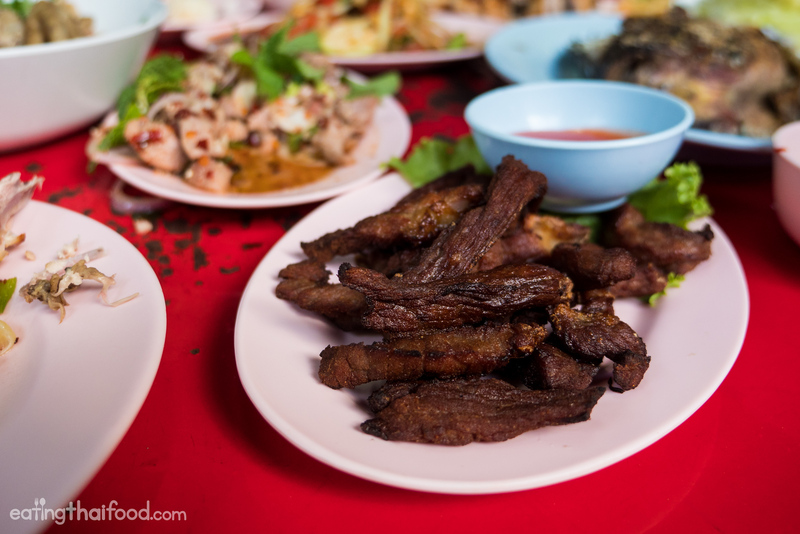 The final dish we ordered was neua dad diaw (เนื้อแดดเดียว), strips of beef, dried in the sun for a day, and in this case, then deep fried. Dipped in the sauce was even better! It was also very good. The meat was dry like beef jerky on the outside, yet a little more soft on the inside, and nice and salty. 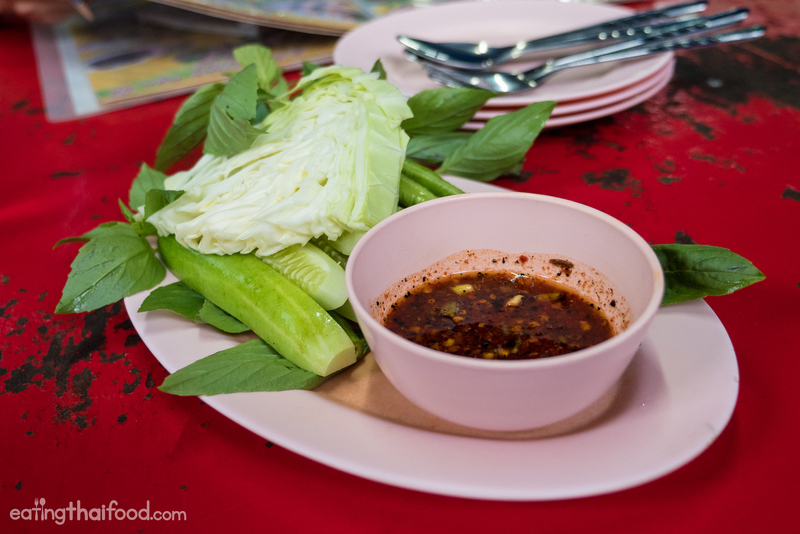 I especially enjoyed the neua dad diaw (เนื้อแดดเดียว) dipped into the nam jim jaew sauce. Our total bill for 3… but we ate a lot. 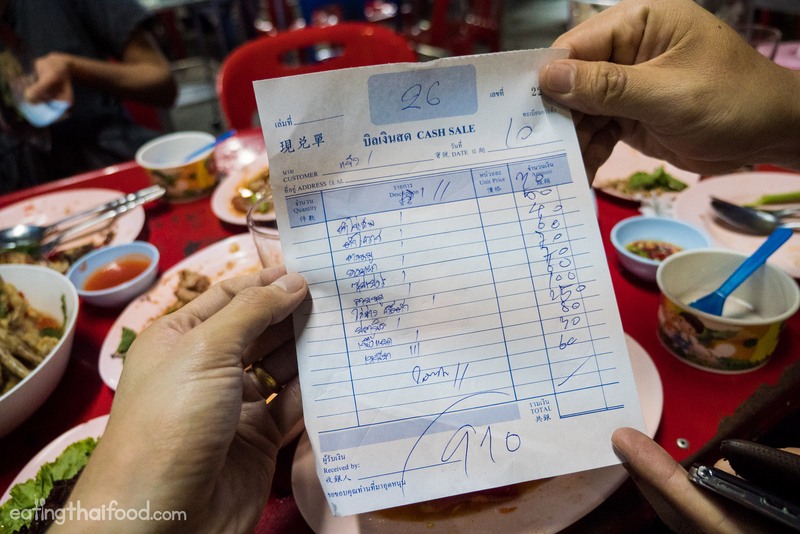 Our total bill for everything we ordered came to 910 THB, which is a little expensive considering there were just 3 of us eating, but we definitely ordered and ate enough food for a couple more people. The prices are overall very typical of street food in Silom / Sathon. 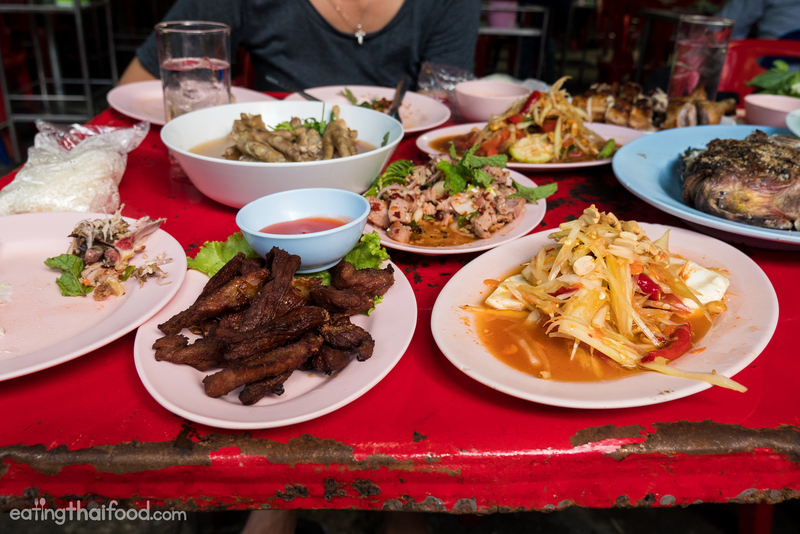 You could get away with paying about 150 – 200 THB per person or more depending on how hungry you are. Laab Udon (ร้านลาบอุดร) is a restaurant in Bangkok that serves just about the full range of Isaan (northeastern) Thai dishes on their menu. 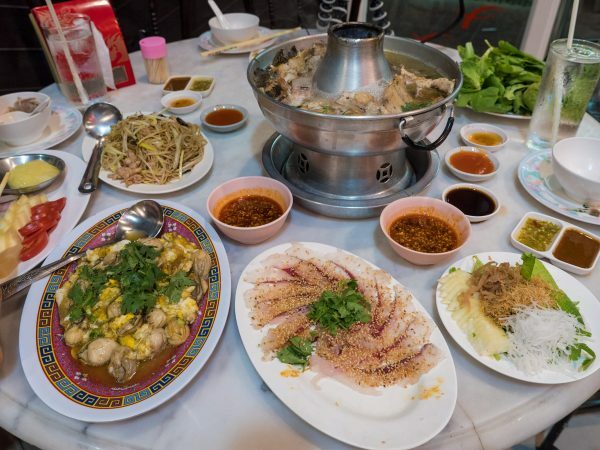 Some of the dishes I had weren’t the best, but their grilled fish was excellent, and their location and atmosphere – street food style under a makeshift shelter while surrounded by giant skyscrapers – was fantastic. 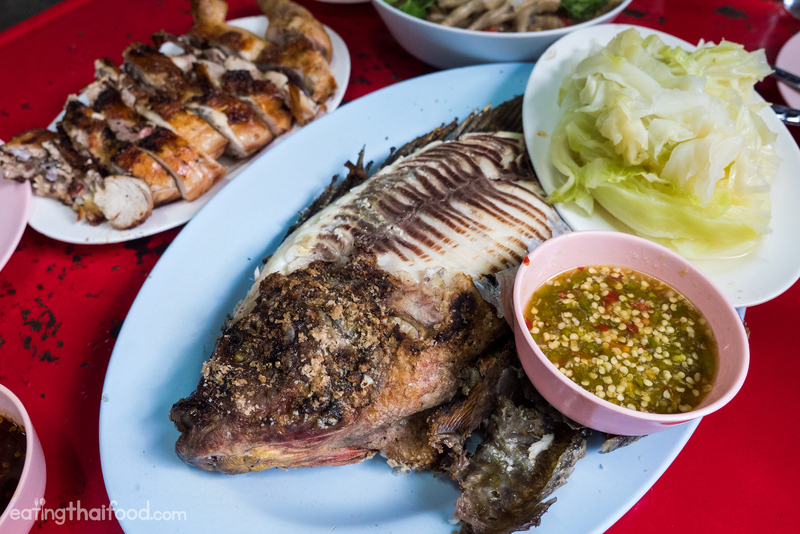 Overall, Laab Udon (ร้านลาบอุดร) is a good restaurant located right Surasak for Isaan food, and it’s especially a good place to go with friends and hang out, have a few drinks, and enjoy a grilled fish. เปิด 16.00 – 01.00 น. 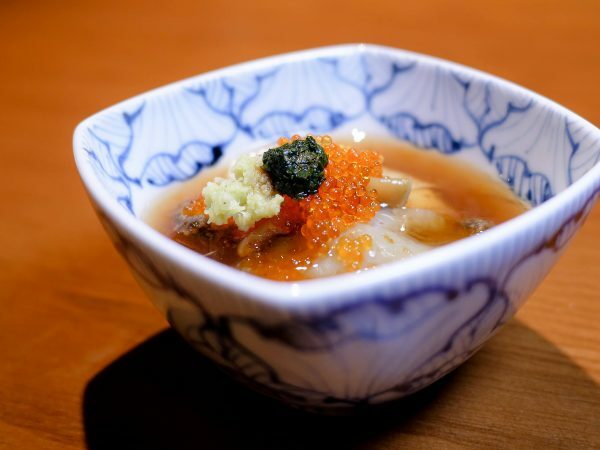 How to get there: Laab Udon (ร้านลาบอุดร) is located on the corner of Sathon and Charoen Rat road. Take the BTS to Surasak, Exit #2, and the restaurant is literally just seconds from where the staircase takes you down on the corner of the intersection. 12 comments. I'd love to hear from you! Wow what a great thai food article. Best one I have come across! My favorite is the dried beef and pork dishes, with a yummy Tom Kha Ga soup as starter. 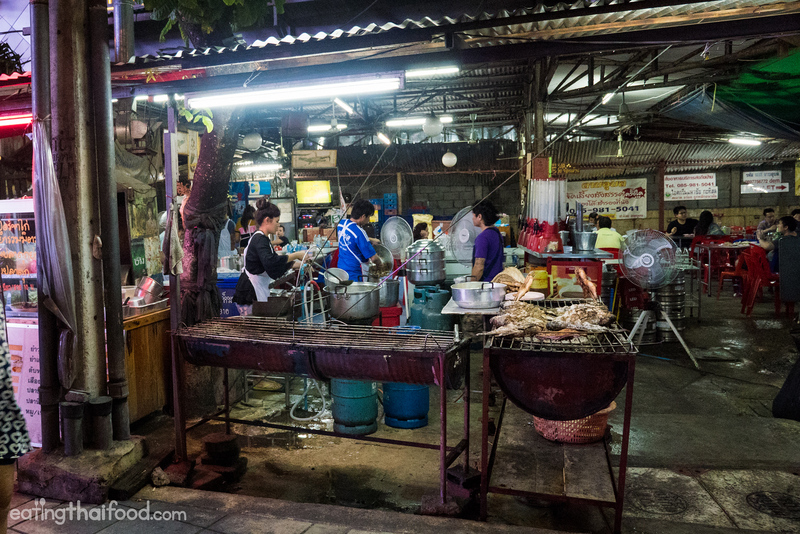 Awesome blog and equally awesome videos about Bangkok street food! That fish looks good, Mark. The look of the chicken feet put me off a bit but I guess I would want to try it at least once. I didn’t really think of it before but Thai cuisine doesn’t seem to use potatoes much. That’s a little surprising isn’t it considering it’s one of the most popular vegetables in the world? Any particular reason you know of? Hey Manu, thanks for reading. Potatoes are rarely used I guess because they are not native to Thailand, but they are used in a few dishes like massaman curry, which have a lot of outside influence. It’s kind of tradition, every time I go to Udon I’ll get a plate of Laab Moo with sticky rice. And it’s also one of those dishes that really should be at least somewhat spicy. Hey Stefan, really appreciate it, thank you very much! Damn. I am not going to be able to get those chook feet out of my mind. Adding… (notwithstanding that which I did not want to see) – another fine post Mr Mark. Haha, sorry about that Steve!